The annatto tree is a tropical plant native to the Caribbean islands, continental Central America and the western part of South America. The food coloring and condiment that is extracted from the seeds of the achiote fruit is called annatto and has a wide array of uses. 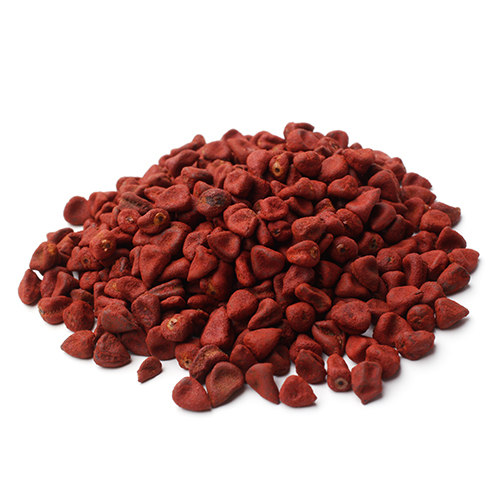 Achiote seeds (aka achiote) are the slightly sweet and musky-flavored red seed of the annatto tree and are available whole or ground. This bright orange-red spice has a peppery aroma and a subtle flavor that’s been described as nutty, sweet, and earthy. It is often used to impart a yellow or orange color to foods, but sometimes also for its flavor and aroma. When annatto pods dry and crack open, they expose seeds of a red color, from which red pigment can be extracted. This is why the achiote tree is often called the lipstick tree. Annatto’s strong pigmentation makes it a natural food dye, and has plenty of applications in cosmetics. Annatto is a natural alternative to synt hetic food coloring compounds. Ground annatto seeds, often mixed with other seeds or spices, are used in form of paste or powder for culinary use. Annatto and its extracts are now widely used in an artisanal or industrial scale as a coloring agent in many processed food products, such as cheeses, dairy spreads, butter and margarine, custards, cakes and other baked goods, potatoes, snack foods, breakfast cereals, smoked fish, sausages, and more. Annatto powder mixed with other spices and herbs can be turned into an annatto paste to marinate and give a smoky flavor to meats, fish, and poultry. On the Spanish-speaking Caribbean islands, it’s used to make yellow rice. In the French Caribbean, it is used to make a fish or stew with berries and lime known as blaff. Achiote is a tropical plant, and therefore requires a warm, dry climate. Annatto is commonly grown from woody stem cuttings or from seeds. The best suited period for raising nursery is between April-May, before the onset monsoon. Within 8-10 days, seeds germinate. The first crop is obtained after three years of planting and the plants continue to give economic yield for up to 8-10 years with proper management. Generally, the plants flower in the last week of August and the flowering continues up to the middle of October.